Squinting through the falling darkness beyond the windshield of her rented SUV, Maggie Iverson consumed her imaginary glass of eggnog, one cool and creamy sip at a time, until her fingers finally loosened on the steering wheel. She called it Flavor Meditation—a relaxation trick she’d invented in seventh grade while waiting to perform her piano recital. Standing off stage, heart hammering, she’d caught a whiff of chocolate cookies being set out for the post-concert reception, and decided that she’d be better off imagining eating one of those warm, gooey cookies than contemplating the butterflies banging around her stomach. Barely five minutes later, she’d stepped out onto the stage and completed her piece flawlessly. After that, Maggie had found many more opportunities to hone her technique. So that by the time she was taking final exams in college, she was consuming imaginary five-course dinners—including appetizers and dessert—and scoring in the top of her classes. Her first year at Empire Marketing and Media in Boston, when Maggie had felt certain every new email alert was notice of her firing, the technique had been gold—and four years and two promotions later, Maggie hadn’t needed to employ her Flavor Meditation in a very long time. Until tonight. When she’d pulled out of the airport car rental lot and found herself navigating narrow mountain roads with more twists than a box of ribbon candy. Which explained why it had taken her an embarrassing two hours to get from the airport, despite the GPS’s insistence that the journey should take fifty minutes. But now, at last, a wooden sign greeted her, draped in pine boughs: Welcome to Snowfall, Vermont—Where Snow has fallen every Christmas since 1917! Maggie frowned at the carved letters as she steered past, her gaze swerving dubiously back to the bare ground on either side of her headlights. No wonder she’d been hired to pump up promotion for the struggling resort town. With two weeks until Christmas eve, Snowfall looked far from a winter wonderland. Not that the decision to leave Boston for a week at the height of the holiday season had been a hard one. Michael, her boss, had assured her the trip could wait until after New Year’s—that any changes they made to the website wouldn’t impact Christmas visitors since holiday tourists would have already made their plans—but Maggie had reminded him that she didn’t take holidays when it came to getting the job done, and wasn’t that why he picked her to head up the design team in the first place? Ever since getting her big break at Empire, Maggie had made it clear to Michael—and anyone else at the company who’d listen—that succeeding in her field was her number one priority. And if that meant working holidays and missing celebrations to get the best accounts, then so be it. With her newly retired parents always on the cruise circuit, it wasn’t as if Maggie had a home base to come back to for holidays anymore. And she certainly wasn’t leaving behind anyone to stand under the mistletoe with, either. After three failed holiday romances in a row, Maggie had come to the not-so-difficult conclusion that love at Christmas was simply not in the cards for her. So why not seize the moment? Another curve and the road blissfully straightened, the thick fence of pines on either side of her thinning as Snowfall emerged and Maggie felt her fingers loosen over the wheel. She’d been skeptical of the charming pictures she’d seen of the town online—after all, she made places look and sound better than they actually were for a living—but as soon as Maggie drove under the archway of twinkling lights and passed the quaint storefronts of downtown Snowfall, her heart lifted. Maybe redesigning the website for the historic resort town wouldn’t be such a tough job after all. The key, she’d already decided, would be to highlight what made the town of Snowfall unique compared to all the other bigger hotels and resorts that had blown up nearby over the years. Passing the town green and spotting a statue of an alpine skier dressed in a Santa costume and hat, Maggie could see there was great charm in this place. Character. History. After all, the famed Wintersong Lodge, where she’d be staying for the next week, had been active since 1902, bringing families to enjoy a variety of winter activities. Maggie looked forward to digging into its past to find that singular gemstone. As a PR person, she knew that the cornerstone to any good marketing campaign was to find the story behind the event. Consumers—people in general, really—loved stories. Maggie knew there was a great story here in Snowfall. And she couldn’t wait to find it. 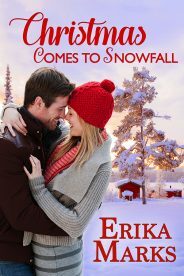 Did you know that Christmas Comes to Snowfall and many titles are available digitally from Tule's own bookstore? Check it out!